SFCDC policy committee members meeting and advocating for effective policy and programs to expand affordable housing and economic opportunity in Miami Dade. The Nonprofit Board Builder is designed to match individuals with nonprofit organizations seeking board members as a means to strengthen the leadership of nonprofits working to expand economic opportunity in Miami-Dade County. SFCDC organizes workshops and one-on-one technical assistance for affordable housing developers, community developers and other community based organizations working to expand affordable housing and economic opportunities throughout Miami-Dade County. We also work to build capacity of Miami-Dade's community development sector. One of our ongoing series is "Tools You Can Use" where we provide information on new and underutilized tools that are available to local community developers to expand affordable housing and neighborhood level economic development/economic opportunity. SFCDC also partners with other organizations, both national and local, to undertake capacity building and training efforts. Your support will help us develop additional training and capacity building opportunities that strengthen nonprofit organizations and develop skills of individuals working in the area of affordable housing and community development. 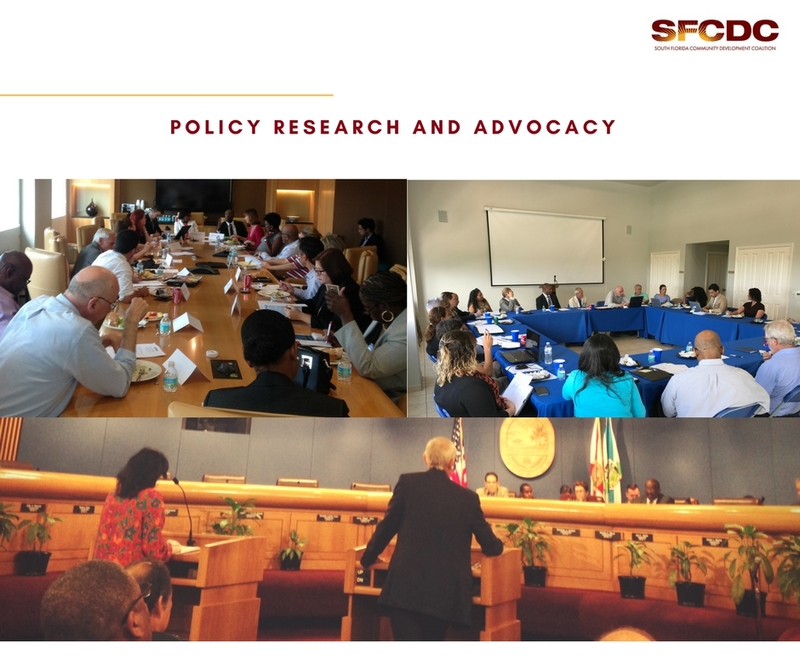 SFCDC conducts policy research and advocates for policies that lead to more equitable and effective community investment and programs. SFCDC members help shape community development public policy through our housing and economic development committees. The committees meet bi-monthly and are staffed by SFCDC. Your support helps us enhance our ability to keep the community informed on important affordable housing and community development policies and programs. SFCDC convenes around issues related to affordable housing and community development, by bringing both national and local thought leaders together, from various backgrounds, to share best practices and promote solutions oriented conversations. SFCDC fosters collaboration by identifying and connecting members and other community based organizations. We facilitate partnerships that expand a service or allow an organization to offer a new program, without the need to create one from the ground up, hire new staff, etc. Our focus includes all community based organizations seeking mutually beneficial partnerships to advance critical areas of work to improve the lives of low-to-moderate income individuals, families and neighborhoods. Executive Director, Partners for Self Employment, Inc. Learn more about South Florida Community Development Coalition Inc.
Make a gift to South Florida Community Development Coalition Inc.